From Halkidiki we headed eastward. Somewhere on our way we left the region of Macedonia to enter into the region of Thrace. 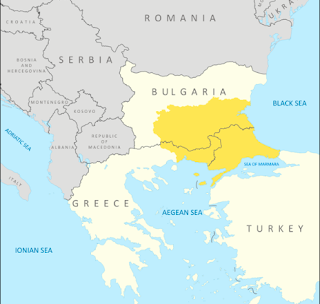 This is a region that strechtes out in three states, Greece in the west, Bulgaria in the north, and Turkey in the east. It has always been the passage way between the Asian east and the European west and thus a region where cultures met and mingled. On our way east we gradually saw the influence of islam become visible, more east means more mosques and more veiled women, also in this part of Greece. In ancient times Persian kings named Darius and Xerxes passed through here on their way westward, and later Alexander the Great left Makedonia through here on his conquers towards the far east. About 120 BC the Roman consul Egnatia had the route surfaced and turned into a real road, therefore the name: Via Egnatia. And today the two of us use the same road on our venture to the east. So we are certainly not the first travellers to pass through here and use this pavement, we feel in good company (though on different means of transport).